Paris Premier Benches are a welcome addition to any setting. They provide classic good looks, comfortable contours and rugged durability. The fully welded, all-steel construction means that no assembly is required. The thermally bonded powder coating also assures long-lasting beauty. Frost code 2040 steel outdoor benches are designed and manufactured in Canada to provide both a rugged and modern seating solution. All steel construction of heavy 12 gauge hot rolled steel finished by twice coating in RAL super durable TGIC-free polyester powder coating rust proof paint. Built in arm rest and ergonomic design make the bench a comfortable, yet durable option. Feet allow the unit to be anchored to the ground. Tested to survive harsh summer and winter weather. Frost code 2060 steel outdoor benches are designed and manufactured in Canada to provide both a rugged and modern seating solution. All steel construction of heavy 12 gauge hot rolled steel finished by twice coating in RAL super durable TGIC-free polyester powder coating rust proof paint. Built in arm rest and ergonomic design make the bench a comfortable, yet durable option. Feet allow the unit to be anchored to the ground. Tested to survive harsh summer and winter weather. A perfect dining solution, the Stillwell Bench elevates any existing dining table, with its easy functionality and playful design. Pull it up toward the table and instantly gain extra seating, without compromising on style. Mid-Century Modern and airy craftsmanship offer an understated and timeless quality here. No need to drag chairs to the dining room, the bench work well in the living area too, and is there when you're ready to use it. More guests? No problem. 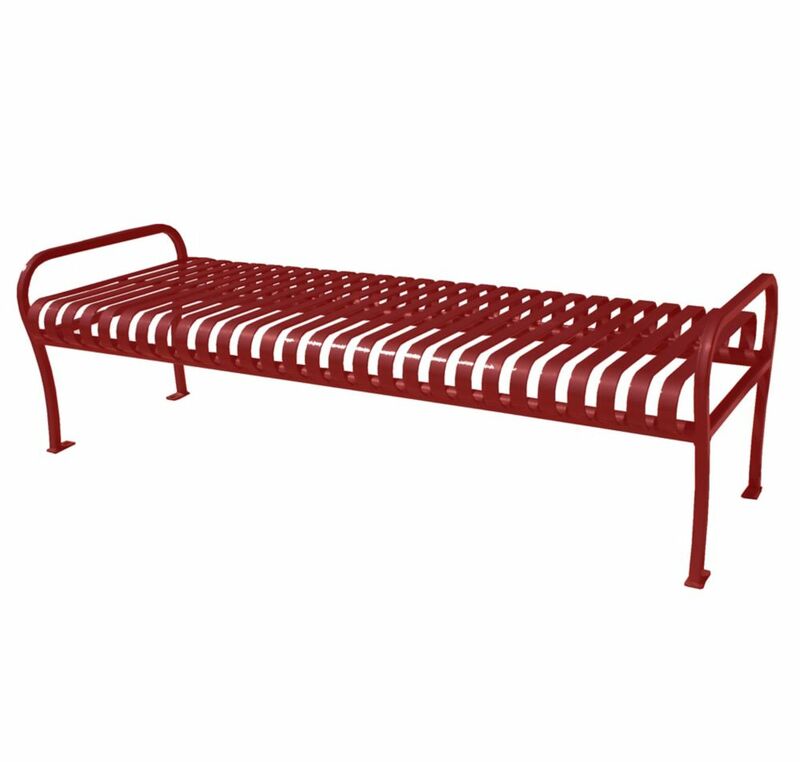 6 ft. Red Premier Backless Bench Paris Premier Benches are a welcome addition to any setting. They provide classic good looks, comfortable contours and rugged durability. The fully welded, all-steel construction means that no assembly is required. The thermally bonded powder coating also assures long-lasting beauty.